Dubai, UAE, May 18,2017: The UN Refugee Agency, UNHCR, switched on today the newly constructed solar plant in Jordan’s Azraq refugee camp. Funded by the IKEA Foundation’s Brighter Lives for Refugees campaign, the solar farm has brought power to a population that lived for two years without electricity and will contribute to the Jordan national energy strategy to achieve a green economy by 2020. The 2-megawatt solar photovoltaic (PV) plant provides electricity to 20,000 Syrian refugees living in almost 5,000 shelters in Azraq camp, covering the energy needs of the two villages connected to the national grid. 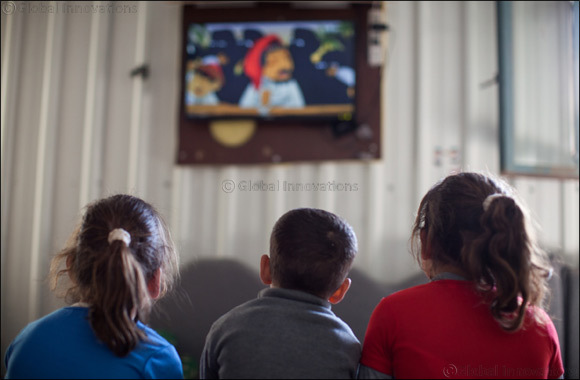 Each family can now connect a fridge, a TV, a fan, have light inside the shelter and charge their phones, which is critical for refugees to keep in contact with their relatives abroad. Azraq camp opened its doors in April 2014 and is located in a desert area in northern Jordan, with hot summers and harsh winters. The lack of electricity has been one of the main challenges faced by its residents, making daily activities difficult, such as cooking, washing the clothes, studying or walking safely to the washroom at night, especially for women and children. The introduction of electricity will help address these challenges and significantly improve the well being of Azraq residents. For the last two years, refugees have been living with the sole support of solar lanterns distributed on their arrival and 476 solar street lights installed in one of the villages, both funded by the IKEA Foundation. The Azraq’s solar farm is the first solar plant built in a refugee setting in the world. In Jordan, where the cost of electricity is high, the solar plant will allow UNHCR to provide electricity to Azraq camp residents free of cost, savings that will be invested in other needed assistance. The solar farm will result in immediate savings of US$ 1.5 million per year and it will reduce CO2 emissions by 2,370 tons per year. Once the solar plant is upgraded from 2 to 5 Megawatts and operating at full capacity, it will produce three times these savings and reduction in CO2 emissions and cover all of Azraq’s energy needs. Connected to the national grid, any extra electricity generated will be sent back free of cost, supporting the host community energy needs. The construction of the Azraq solar plant has also meant an income opportunity to over 50 refugees who have been trained and employed to help build the solar farm under the supervision of the Jordanian solar company Mustakbal, which led the works on site. Part of these refugees will be also in charge of the maintenance works in the future. The solar plant, which cost 8.75 million euros, has been entirely funded by the IKEA Foundation through the Brighter Lives for Refugees campaign that raised 30.8 million euro for UNHCR projects. For each LED light-bulb sold during the campaign period, the IKEA Foundation donated 1 euro to UNHCR to bring renewable energy and education to refugees. “The world’s first solar farm in a refugee camp signals a paradigm shift in how the humanitarian sector supports displaced populations. UNHCR Jordan will save millions of dollars, while reducing carbon emissions and improving living conditions for some of the world’s most vulnerable children and families”, said Per Heggenes, CEO of the IKEA Foundation. “We are very grateful to everyone involved—especially the IKEA customers and co-workers who took part in the Brighter Lives for Refugees campaign, the UNHCR, the Jordanian government, EDCO, and most of all, the Syrian and Jordanian people who made this project a reality”, he concluded. Providing renewable energy sources to refugees and their host communities is one of the priorities for UNHCR globally. Innovative partnerships such us the one with IKEA Foundation help UNHCR find forward looking and sustainable solutions for the refugee community.